Keep your children’s teeth healthy with these expert tips. Start good dental care early by wiping baby’s gums with gauze or a clean damp cloth after each feeding. 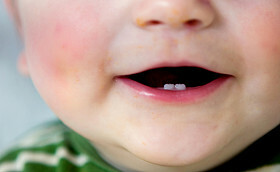 Once that first tooth appears, use a soft, infant-sized toothbrush and plain water. After age two, a pea-sized amount of toothpaste will do (you may want to use just non-fluoridated until she’s old enough to spit it out, usually around age three or four). Don’t offer food or a drink of anything besides water after the evening tooth-brushing, advises McConnachie. Don’t rub alcohol on your baby’s gums. Even a small amount can be harmful since there’s no predicting how your baby will react, says Mia Lang, an assistant professor of paediatrics at Edmonton’s Royal Alexandra Hospital. Medications, such as ibuprofen or acetaminophen, should never be applied directly to baby’s gums either since they can cause further inflammation and irritation. For more information on over-the-counter medications, ask your Pharmacist for advice. Don’t dip your tot’s pacifier in honey to try to distract her from teething pain. “Honey is not advised in the first year of life because of the risk of botulism,” says Jeremy Friedman, chief of paediatric medicine at the Hospital for Sick Children in Toronto and co-editor of Caring for Kids: The Complete Canadian Guide to Children’s Health. Do limit chewy, sticky snacks, such as raisins and granola bars. “They may be healthy, but they’re the worst kinds of food for growing teeth,” says McConnachie. If you do give them to your child, make sure she brushes well immediately afterwards. Do give your child a bottle or sippy cup with water for comfort or to fall asleep. Letting her walk around or drift off with a bottle of juice, milk or formula can lead to tooth decay. Don’t share food utensils with your child or lick off a dirty pacifier and put it back in her mouth (yes, some parents do this). Bacteria can be passed from parent to toddler and cause tooth decay.